The Open Billet Box has received many positive reviews on magic and mentalism forums and has led to many discussions about other possibilities with the prop. 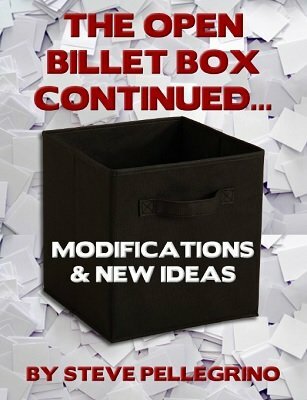 Over the past year Steve Pellegrino has gathered suggestions and developed some new modifications to the box as well as other ideas to create a new manuscript to give you new directions for your Open Billet Box. Details on how to lock the gimmick. Different kind of boxes you can use. A new routine, Synchronicity, which takes two apparently unrelated random thoughts from the audience and brings them together for an amazing prediction revelation. And additional ideas for making the most out of your prop.